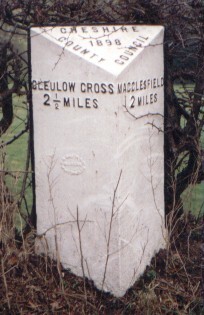 This is Clulow Cross in Cheshire, located on the borders of Staffordshire and Derbyshire, in a very remote spot. The only information regarding its history is contained in a book by Isaac Finney, written by him after the Scientific Society had visited the site on July 21st 1883. Further information available Here! To see a location map of the cross courtesy of www.streetmap.co.uk click Here!, please note that although we have shown the location of Clulow Cross we do not imply that there is public access. Notice the spelling of Clulow on this old sign post.